When it comes to chimney repair, contact Thomas Quality Construction. Taking a working chimney for granted can be costly as certain repairs are commonly required over a lifetime. 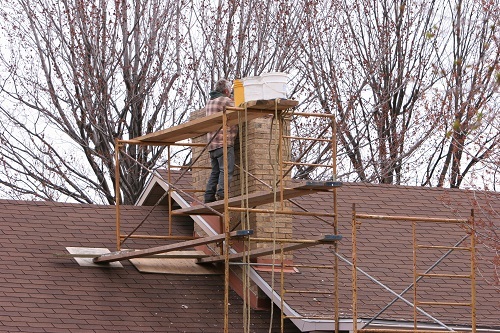 Some common chimney repairs are often done because people just don’t know to be on the lookout for ways to reduce the repairs. For example, the type and amount of firewood burned in a wood burning fireplace has a lot to do with buildup of a substance called creosote. Creosote can cause your fireplace to smell during the warmer parts of the year and if it is not addressed, it is the substance that can catch fire and cause damage to your home. Being aware of this can lead to a maintenance schedule where the chimney can be swept and inspected based on the burn. Another thing to lookout for is water coming into your chimney system. If you see or hear water dripping anywhere around the firebox, mantel or chimney, contact Thomas Quality Construction immediately. Water is the number one enemy of chimneys. It can damage the brick, mortar and flue and can cause some expensive repairs that have to be made to the chimney, walls, mantels and ceilings in the room where the fireplace is. Smoky smell even without a fire. When moisture builds up on the creosote over time, a constant smoky smell can develop. If this occurs, chimney sweeping is required. Smoke from your chimney is not going up the chimney but back-filling into your room.This can be a blocked flue or bad chimney draw. Either way, a chimney should be swept and an inspection done to see if additional repairs are needed. A dead animal stuck in the ventilation area can result in a rotting smell. The area should be swept clean and a compatible sized chimney cap should be installed to prevent future animal invasions. If a cap is already in place, it needs to be checked for gaps or cracks. There’s a white residue on the brick or stone. This condition is called efflorescence and it indicates water damage and a thorough sweeping is recommended followed by waterproofing the brick of the chimney with a commercial water repellent. The brick in your fireplace is cracking. For masonry units, a certified chimney sweep will be able to remove the damaged bricks and replace them. The bricks are flaking or turning back to sand. This is called spalling and is due to bricks being exposed to water. This is a hard repair that requires a chimney repair expert to be able to remove the damaged bricks and replace them. Dripping noise coming from the chimney. This may be caused by a water leak. Ignoring a leak can result in damage that requires costly repairs. When a rebuild of the chimney is not needed, brick replacement is the next best option. This process includes cutting out the damaged brick, allowing minimal disturbance to the surrounding masonry. Other economic forms of brick repair may include waterproofing or chemical cleaning. At Thomas Quality Construction, we value quality. This means taking the time to find a brick and mortar match that blends seamlessly with your existing wall or chimney. Stay away from repairs that simply hide damage with skim coating or patching techniques. Thomas Quality Construction eliminates worry by taking the time to educate our customers. Our simplified explanations of your chimney repair needs will eliminate fear and replace them with confidence. We serve Central Kentucky, Madison County and Garrard County. If you’re in need of chimney repair, please give Thomas Quality Construction the opportunity to serve you.